Summertime is the best time of the year for outdoors and swimming is the best pass time of the summer. It’s the time to buy some bathing suits, new floaties for a pool or beach umbrella. With all this, also think about the safety of your kids that how much you prepared your kids for pool or beach? Water can be dangerous for kids. Association director of the Injury Prevention and Research Center stated that drowning in pools is the main cause of death for one to four years old kids while five years or older are more likely to drown in natural water resources like rivers, ponds etc. 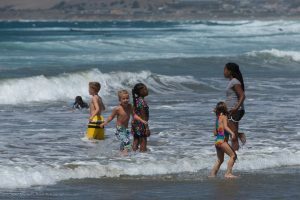 Here are some water safety tips to make sure that your little one is safe in the water. It is important to keep eyes on kids when they are near the water. One can easily get distracted. It is important to make sure that kids are getting your full attention when they are in the pool that means not talking on phones for too long or trying to take a perfect selfie. There is nothing more important than your child. It is important to use the sunscreen or wear sunblock, especially for kids. The sun’s ultraviolet rays are powerful and sometimes causes skin cancer. Baby skin is soft and can be affected by ultraviolet to cause serious diseases. So it is important to take care of skin and use sunscreen. Make sure you have floaties on your kids and talk to your kids about their uses. 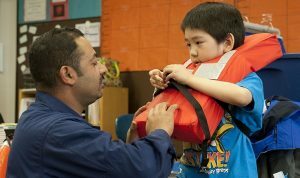 Sometimes if they accidently fall in water these life vests prevent them from drowning. With a tent or umbrella baby can take a nap under the umbrella or you can breastfeed in shade to stay cool. These tents or umbrella can also prevent your baby from sunlight. You can easily get these items from your local stores during the summer. Hats are essential for kids. That will help to protect little scalp and tender eyes. It will help to protect your baby’s face from the sunlight. Sometimes your kids can lose their hats. Be sure you have an extra hat in hand. You can assign a guardian when you can’t watch the kids. A mistake that many people make is thinking that other people are watching their kids. But it is important while leaving your kids, you can tell someone to watch your kids until you came back there. Don’t think that someone is going to keep their eyes on kids until you give them a responsibility. Keep your babies safe and secure every summer. Keep eyes on your kids when they are in a pool or lake or even near the mall fountain. They will be safe when you are with them.